As fall comes in with a chill in the air, an ongoing shopping list is probably sitting on the counter for your Thanksgiving dinner menu. 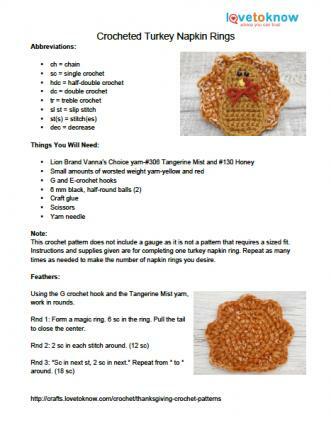 Take a moment to enjoy the season with yarn, a crochet hook and patterns for crocheted Thanksgiving decorations. Turkeys and cornucopias are common symbols of Thanksgiving. These two free patterns are appropriate for both the experienced and beginning crocheter, and can be completed within a day. Click on the pattern thumbnails to download and print the instructions using Adobe Reader. This pattern makes one napkin ring. Repeat as many times as needed for all of your dinner guests. 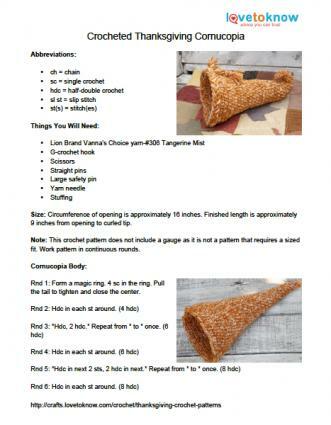 Click to download and print the pattern. Fill your completed cornucopia with fall leaves, small gourds, and other fall items for a lovely table centerpiece. A specific brand of yarn was listed for these patterns, but other brands of worsted weight yarn can easily be substituted. Eliminate the ring on the napkin rings and tie your turkeys to cord or ribbon for a festive Thanksgiving banner. Alter the turkey pattern for napkin rings for other holidays. For an Easter chick, crochet the body using yellow yarn. Glue yellow craft feathers to the side edges of the chick and eliminate the crocheted turkey feathers and the waddle. For a snowman, simply crochet the body using white yarn, stitch on a basic face and add a strip of ribbon for a scarf. For a refresher on making a basic three-strand braid with yarn, try this tutorial. Fall marks the beginning of holiday crafting, but time can be an issue. Try these quick and easy projects for more Thanksgiving decor. Each of these patterns is easy and can be accomplished by a beginning crocheter or a seasoned pro. Add Indian corn to your table centerpiece with these classy, stuffed cobs from Create. You could even add them to your crocheted cornucopia or attach them to a cord and hang them as a garland over your fireplace. What is Thanksgiving without the smell of fresh baked pumpkin pie? If you would like that wonderful fragrance without turning on your oven, whip up a few of these adorable crocheted pumpkin pies from Crafty is Cool. There is a sachet of pumpkin spice tucked inside to give any room a seasonal aroma. When you think of fall or Thanksgiving, pumpkins are probably one of the first images to pop into your mind. Repeat Crafter Me does not disappoint with these sweet, miniature, crocheted pumpkins. Make them to finish off your Thanksgiving table decor, attach to a wreath or add one to a bow tied around the pumpkin bread you are gifting your neighbors with. Crocheting is a wonderful activity for relaxing after a busy or stressful day. Take the time to reflect and be thankful while crafting beautiful creations.